For use with Model B and later Model A Indoor Rowers. 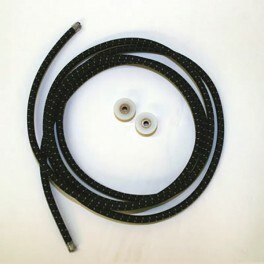 10 foot, black and white flecked elastic shock cord (or bungee cord) that recoils the chain on recovery. Includes two 1-1/8" shock cord pulleys. Fits only Model B Indoor Rowers (Ergometers) and later Model A Indoor Rowers. See more info. If your chain recoils slowly—or not at all—between strokes then you should inspect your existing shock cord. If the shock cord is not badly worn, frayed, or broken you may be able to correct the recoil problem by adjusting the shock cord. If the shock cord is badly worn (gray rubber core is visible) or broken, you should replace it.